The "Father of the Delta Blues" recorded this namesake LP for Columbia Records a year later in 1965. It's become, in the words of Living Blues magazine — "Essential recordings by one of the greatest bluesmen ever." And now, Analogue Productions presents a reissue unmatched in sonic quality and luxury presentation. For our version we turned to Ryan Smith at Sterling Sound to remaster the recording from the original master tapes. The freshly cut lacquers were then plated and pressed on 200-gram vinyl by our own Quality Record Pressings. The Hybrid Stereo SACD version was authored for SACD by Gus Skinas at the Super Audio Center in Boulder, Colo. When I first heard this I was stunned at the fidelity of this pressing. These tapes are decades old yet they still give off the whole emotional package that was inherent in Son House's music. The music is down home blues straight from the Mississippi delta with sorrow, yearning and celebration in life and comfort of religion as deep a part of life in the delta as can be sung. 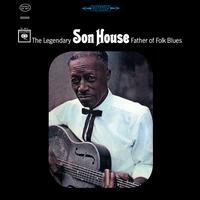 Son House had talent and an easy delivery that is shown here at it's best with excellent mastering, lacquer cutting and pressing. This is one of those albums that will show you how good a job Analogue Productions is doing with complete control of the entire analog chain from master tape to the record you hold in your hands. Top it off with good music and you have a winner to be kept and cherished. The previous review says it all. Pristine clarity shines through. Lots of labels out there making this and that promises all in the name of analog reissues. My position is don't listen to what they say, just pay attention to what they do. As far as I'm concerned Chad Kassel and analogue productions have risen to the top of the heap with this record. A shoo in candidate for analog reissue of the year. If you buy this record and play it on one of those cheap tables I feel sorry for you. you will be missing the warmth and clarity on this stunner. If there is a fault with this record I can't find it. from the sound to packaging it is absolutely flawless.